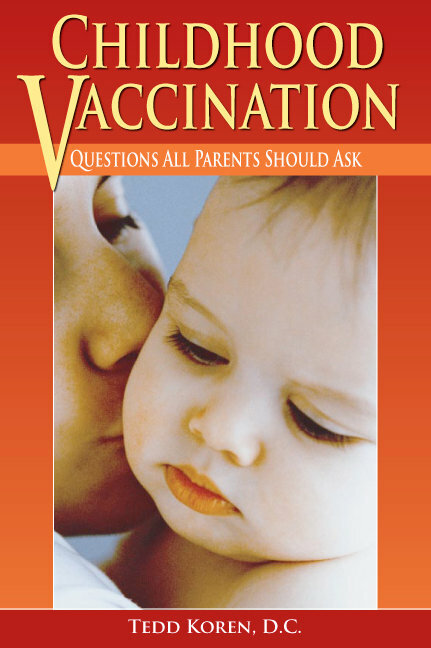 Addresses topics none of the other vaccination books cover! This updated edition, written by Tedd Koren, D.C., is chock full of the latest information on the vaccination controversy – which continues to mushroom – and now includes more material on what really caused polio plus a whole section on autism and junk science from medical journals. Irrefutable information that cannot be denied. You’ll want the exclusive updates contained in this up-to-the-minute book. Shot or no shot? Don't even think of vaccinating a child before reading this book! For parents, patients and doctors. This newest edition, written by Tedd Koren, D.C., is full of the latest information on the vaccination controversy. Dr. Koren asks, and answers, the critical questions that need to be raised when making vaccination decisions. The information in this book will help readers make one of the most important healthcare decisions that a parent can make. Although this is our latest product we now carry, I initially purchased the first edition due to the cover of the book which is the same as Tedd Koren's provocative poster featuring a shockingly stark picture of a bullet with the statement above the bullet reading, "Would you shoot your child with this?" and below the bullet, "Then why would you shoot them with this...." followed by a list of noxious ingredients that slowly fade out.The newest edition has a less provocative cover and is updated with the recent information. The Koren posters are available in 50 sheet format. Tedd presents his material in a question and answer format that makes it so amazingly EASY for parents to grasp. In fact, he goes a step further and encourages parents to pose these same questions to their pediatricians, now that they know the answers, and find out what is their response. What parents usually discover is that their pediatricians are no more than vaccine sales people (glorified drug pushers) who actually know very little about their products. Once parents are armed with this knowledge, it is much easier for them to say "no" and seek healthcare elsewhere. So what are these questions that parents need to know the answers to? They are as follows, and answered with clear citations in each case. 2. Do vaccines have any long-term side effects or damage that may not surface for months or years? 3. Does research show vaccines are safe? 4. Can vaccines cause cancer or fertility problems? 5. Do vaccines cause SIDS (Sudden Infant Death Syndrome also known as Crib Death)? 6. What are the chances that my child may be hurt or killed by a vaccine? 7. Do the assumed benefits of vaccination outweigh the risks? 8. Didn't vaccines get rid of acute infectious childhood diseases? 9. What about polio? Wasn't it eliminated due to vaccination? 10. Was the polio shot given in the 50's and 60's contaminated with monkey virus? Is it causing cancer? 11. Is vaccination why we have so much cancer today? 12. Are there benefits to a child having acute infectious childhood diseases? 13. Are the ingredients in vaccines safe? 14. How do vaccines work on a cellular level? How do vaccines affect the immune system/nervous system on a cellular level? How do vaccines cause damage on a cellular level? 15. Do vaccines affect genetic material? Are we hurting future generations? 16. Is there a conflict of interest in vaccine policy decisions? 17. Can a person legally avoid vaccinations? 18. Is there hope for the future? Tedd Koren has been a true champion of health freedom and is a well-respected author of chiropractic literature and truthful vaccine information. He has also developed his own chiropractic technique, KST - Koren Specific Technique, and travels around the country teaching other chiropractors how effective this adjustment technique truly is and how it can benefit their patients.